Great modern designs can be hard to find. When I browse local furniture stores, I sometimes get the feeling, I am a rare species. Nobody offers quite what I am looking for. Let’s face it, if you look for a mainstream product, you won’t even have to search. They’re everywhere and at a low price too. What if you want to be different? What if you have an affinity for modern design? That’s where it gets difficult and sometimes frustrating. Either you just can’t find anything you like, or it’s so insanely expensive that you have to throw the towel. When it comes to coffee tables or sofa tables, as some of us might call them, Beliani has just launched their new collection in North America. Beliani stands for modern design furniture at outlet prices, so definitely worth a look. The EVORA as shown above is an interesting modern design with great functionality. 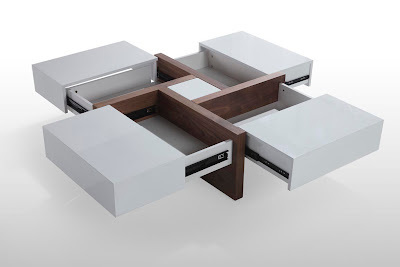 The white lacquer top is split into four sections that reveal drawer storage space when pulled to the side. The structural parts are medium density fiber board with walnut veneer. The LAGOS also uses mainly white lacquered surfaces, that just give the cleanest, sleek look. The center part comes in a wood design with the larger portion being a drawer that offers storage to keep the place tidy. Another great design is the AVEIRO. 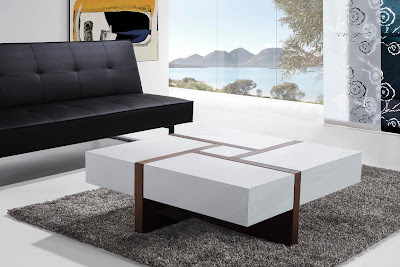 The contemporary coffee table has 3 layers that can be used as surfaces. The top two layers can be swiveled to form a variety of layouts that offer a different look and functionality.